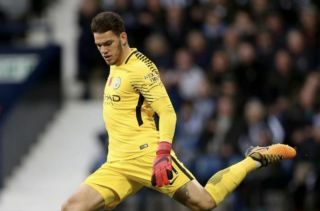 Manchester City number one Ederson showed amazing composure with the ball at his feet in the Premier League clash at Vicarage Road on Tuesday night. The Citizen’s secured a 2-1 win against Watford thanks to Leroy Sane and Riyad Mahrez strikes, while Abdoulaye Doucouré grabbed a late goal for the hosts which ended up being nothing more than a consolation. Pep Guardiola’s men move five points clear of Liverpool at the top of the Premier League table with this latest victory as their dominance of English football continues, with Ederson showing off his brilliant skill in possession during one great first half-moment. The Brazilian shot-stopper played a sublime first-time no-look pass into Vincent Kompany’s feet, which just highlighted his brilliant ability to kick-start City’s attacks. Check out Ederson’s skilful pass below, via Twitter.